Whether you need to create a decoration for an upcoming special event or simply want to make something beautiful for your front door, decorative mesh ribbon wreaths are a fun and easy craft project that anyone can do. They offer unlimited options for customization, so you can put your own creative stamp on this simple design. These instructions will help you create a wreath that's about 18 inches in diameter, but you can make your wreath any size you like. This project will take you about an hour and will cost about $20 in supplies. 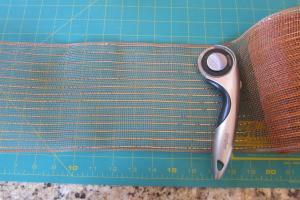 Start by cutting the roll of decorative mesh ribbon into 18-inch lengths. You'll end up with 20 pieces. The easiest way to do this is with a rotary cutter and cutting mat, but you can also use scissors. Simply set the pieces aside until you have the entire roll cut to size. 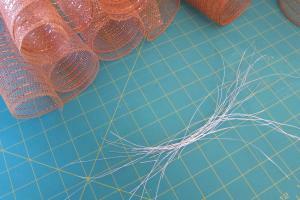 Next, cut 20 pieces of floral wire, each about 10 inches long. Set these aside as well. Pick up one piece of mesh and gather it accordion-style by pinching the middle together. Take one piece of wire and wrap it around the center of the mesh. Twist the wire together in the back to hold the mesh together in this shape. Set this piece aside, and repeat with all of the remaining mesh pieces. 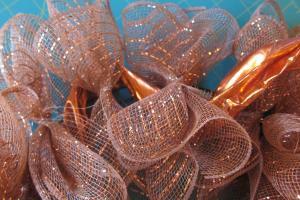 When you have a pile of 20 gathered mesh pieces, you can start applying them to the wreath form. To do this, place the gathered mesh part against the outer ring of the wreath form and thread the wire ends in behind it. Twist the two wires together behind the wreath form to securely attach the mesh piece to the wreath. 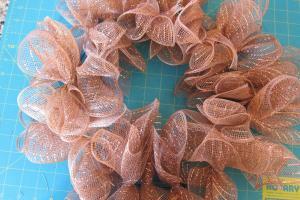 Continue adding mesh pieces to the wreath form, using care to evenly space them around the circle. It's okay if some of the wreath form shows through the mesh. You'll be covering that with ribbon. After you've attached all the gathered mesh pieces to the wreath form, tuck the wires out of sight and make sure everything is secure. Then fluff out the mesh pieces to give the wreath a full look. Turn some mesh pieces sideways for variety. Cut a three-yard piece of the organza ribbon, and begin threading it in and out through the pieces of mesh. You'll be using this to hide the wreath form and add a little extra visual interest. Once you've covered the entire form, tie the ribbon ends together in the back and trim. 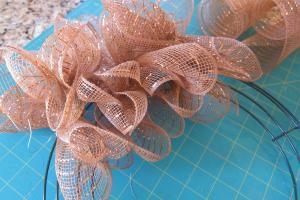 Use the remaining two yards of the organza ribbon to make a bow for the wreath. 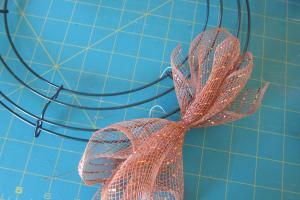 Attach the bow with floral wire to one side of the circle. 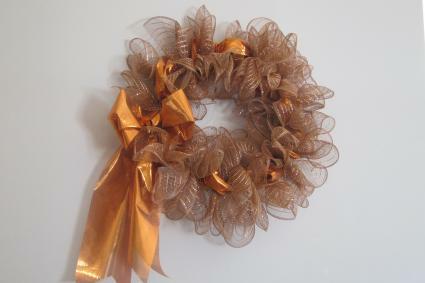 Use two or more rolls of decorative mesh ribbon to make an extra full wreath. Simply add a second layer of gathered mesh pieces after you've finished with the first. 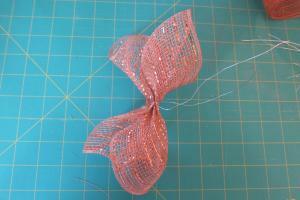 Try using two or three different colors of mesh ribbon for a beautiful two-toned design. You can alternate colors or simply add occasional pops of one of the shades. Attach artificial berries and silk flowers to your wreath for another pretty look. Choose floral elements that complement the color of your decorative mesh. For a wedding or baby shower decoration, add a monogrammed placard to the wreath. Use rubber stamps and a piece of sturdy cardstock to create the placard, and then attach it with floral wire. Use woodcraft letters to create another style of monogrammed design. You can paint them to match the wreath or leave them natural. You'll find that there are dozens of great ways to add extra flair to this beautiful and simple wreath design. Use your imagination to create a decorative mesh wreath that's uniquely you.